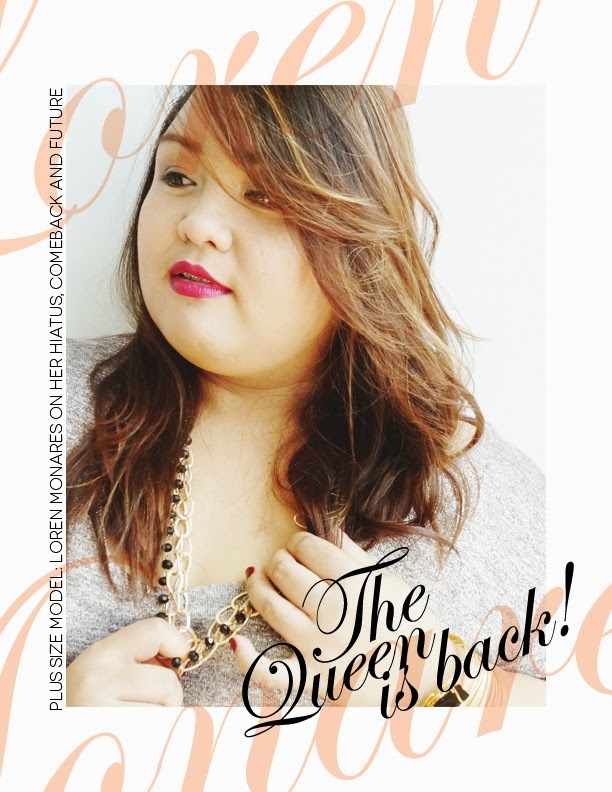 Erzullie Fierce Plus Size Fashion Philippines: PLUS SIZE MODEL: LOREN MONARES | THE QUEEN (?) IS BACK! 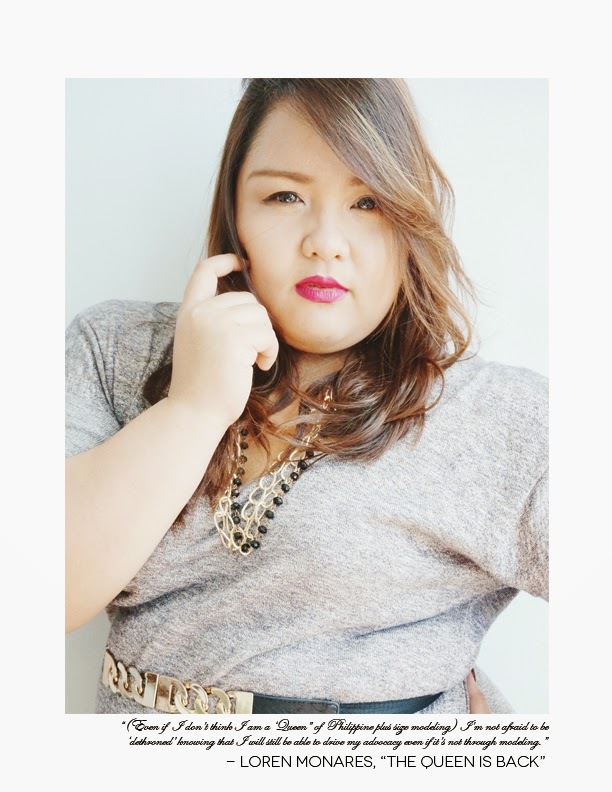 PLUS SIZE MODEL: LOREN MONARES | THE QUEEN (?) IS BACK! 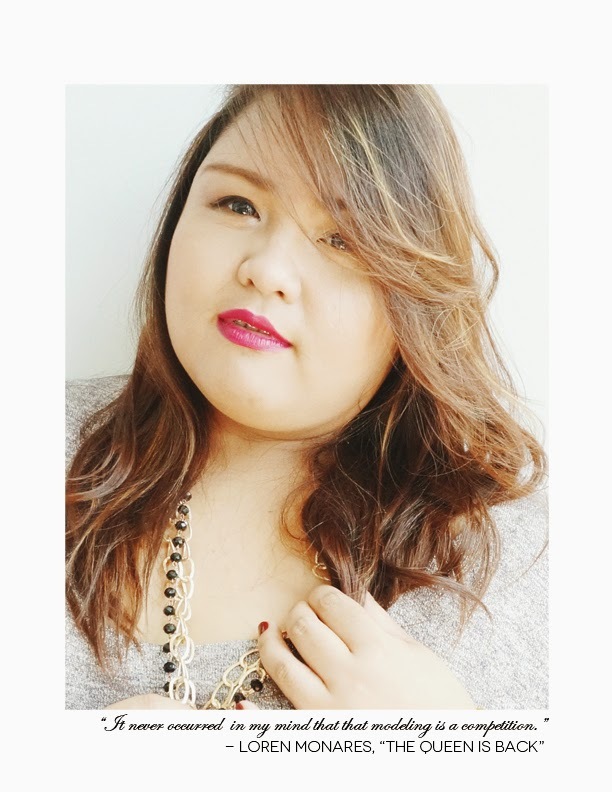 Erzullie Icon and Plus Size Model, Loren Monares, has been in a mild hiatus in the Erzullie campaigns recently. After a string of non-stop campaigns from 2012-2013, for the year of 2014, the brand decided to give her some time to rest her curves a bit. But we all know that that did not stop this plus size scion from being out of the limelight for too long. With projects both off and on the camera, Loren’s career still flourished nonetheless. Celebrating her comeback to the brand’s campaign roster was a daring 2015 campaign for the couture collection. In this interview, she shares her thoughts about her hiatus, her current status and what she thinks about her future as a plus size model and advocate. #1 Last 2014, you were more seen in the OOTD’s than the campaign themselves. What happened? Last year when the Erzullie designers, Aries and Berna, started to formalize the addition of OOTDs and 3 ways to wear apart from the catalog/lookbook and campaign shoots. This, for me, was a good move to give more variety of visual marketing to the public. The designers had to split the photo shoot assignments amongst the models. I was assigned to cover the OOTD’s and some 3 ways to wear while Kat was assigned on the campaign shoots. Why Kat for the campaign? I know the designers have fully studied their plan for 2014 on who to assign for which project and I completely trust and respect their decision. #2 When you found out that you were not going to be part of the campaigns for 2014, how did you feel about it? Why? When I learned that it will be Kat who will do all the campaigns for 2014 collections, I was very happy and excited for them to experience the same journey I had before, knowing that they will hopefully go through that opportunity of understanding deeper their role in the plus size community and make use of it to drive even further our advocacy. I think that the designers made the right choice and just the right timing for everyone and this is what I admire about the designers of Erzullie. After working with them for almost 4 years, I somehow learned how they decide on their marketing strategy. They take things seriously, especially when planning for the future of the brand. They make sure that they are able to match each project with the right model at the right timing. Kat have so much to offer for the brand and I just felt like it was also about time that they be given that opportunity. #3 Did you feel threatened seeing the newer models get the campaigns last year? We are a family in Erzullie, so whatever blessing I have I am wholeheartedly willing to share it with them. It never occurred in my mind that modeling is a competition for us. For me, the true measurement of success is when you are able to impart to others what you have learned and seeing that they are able to practice it and share it as well to others. Looking at the campaign shoots of 2014, I am a proud “ate” because they have definitely gone a long way and I know they will achieve more in the future as they continue to practice and improve their modeling skills. I celebrate whatever success Kat have, not only pertaining to her modeling career, but also to her other field of interests. #4 How do you feel now that Erzullie got you back for 2015? I am happy to take the challenge of doing the campaign shoots again. I know how big of a responsibility this is not only for the brand but for the target market, but I am excited for this. #5 When you were presented with the concept of the Corporate 2015 campaign, what were your thoughts? We were asked to do a bit more daring shots for the Corporate 2015 Campaign. My reaction? Well, not as shocked as the Anniversary shoot 2 years back where I had my first “daring” stint as an Erzullie icon but honestly, I was nervous about this project. Thought bubbles were about whether I will be able to give justice to the concept, will by company be okay with it, or what would my family and friends feel about it. Definitely I consulted and clarified all my questions before doing the project. What made everything easier was the fact that the designers and I both know each other and they know how to handle this kind of project for me. #6 Why did you decide to do the campaign anyway? I decided to come back to doing the campaign for the very same reason that I want to be able to promote plus size empowerment through this field. I always consider this as an opportunity for me to reach out to the plus size community. As for my own development, campaign shoot is a good venue for me to further improve my skills, as I get challenged to explore different styles depending on the requirement of the project. Most of all, I trust the designers that they know I am capable of representing their collections. It gives me even more confidence to take on the challenge knowing that they believe in me and my capabilities. #7 Was it hard for you to get back to the mindset of doing the campaigns again? Why or why not? It was really challenging, given the level of emotions and artistry that you put into campaign is far deeper than the OOTD shoots. For OOTD, the atmosphere is more relaxed and has more freedom in terms of what you want to express depending on the mix and match of clothes you wear. For campaign shoot, you are only asked to wear the best piece in that particular collection and do an editorial pose. Editorial pose, for me, is very challenging because you have to be able to portray the whole collection; it’s like telling the story behind it and the inspiration of which the designers got from when they made the collection. #8 People are definitely thinking it and numerous models look up to you. 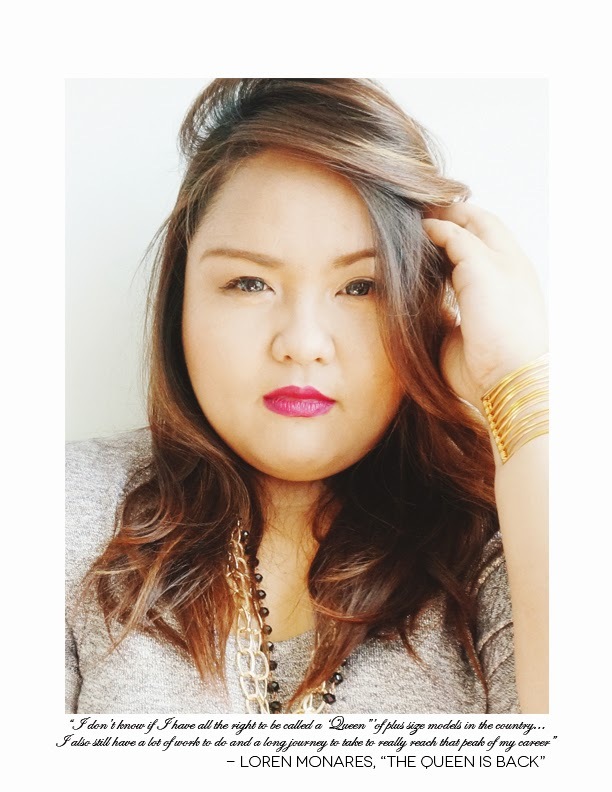 Do you think that you are the current “queen” of plus size models in the country? Why or why not? Honestly, I don’t know if I have all the right to be called a “queen” of plus size models in the country…heheheh Let’s just put it this way, I have just been blessed that I started in this career earlier than most of the other models that I know. Whether it’s a guarantee that I am better than the rest? Definitely NOT! It takes lots and lots of hardwork to really excel in this field…and I must say I also still have a lot of work to do and a long journey to take to really reach that peak of my career. So yeah, not sure if we should call it as “queen” or maybe more of “ate” to the younger ones who are starting with their modeling careers or aspiring to be one. It’s always a great fulfillment for me when plus size women reach out and ask about how I became a model and how I am keeping it. In this little way, I am able to help and inspire them to reach their dreams as well. For me, that’s the best reward that I get out of this career. #9 With a legion of a growing fan base and projects almost left and right, you are becoming one of the most prominent figures in the plus size fashion industry. Are you afraid that one day, one of your colleagues would be able to reach what you have? And dare we say, “dethrone” you? Why or why not? The only constant thing in this world is CHANGE. Sooner or later, changes may happen, I might be shifting my career, focusing on other things, etc… It’s possible that I may not be modeling anymore because of changes in priority. So yes, time may come that I would not be doing modeling projects/engagements but one thing that I would like to ensure by that time is that I was able to impart my experience to others and see them take on the lead. I’m not afraid to be “dethroned” knowing that I will still be able to drive my advocacy even if it’s not through modeling. #10 If you can pick 1 model that you think is also in the rise to the ranks of being an iconic plus size figure, who would it be? Why? This is a tough question, given that both Jay and Kat have different styles and personalities and I believe they both have what it takes to become an iconic plus size. For me, an iconic plus size figure is someone who can represents an empowered plus size woman. If I would need to choose just 1 for now, that would be Kat. 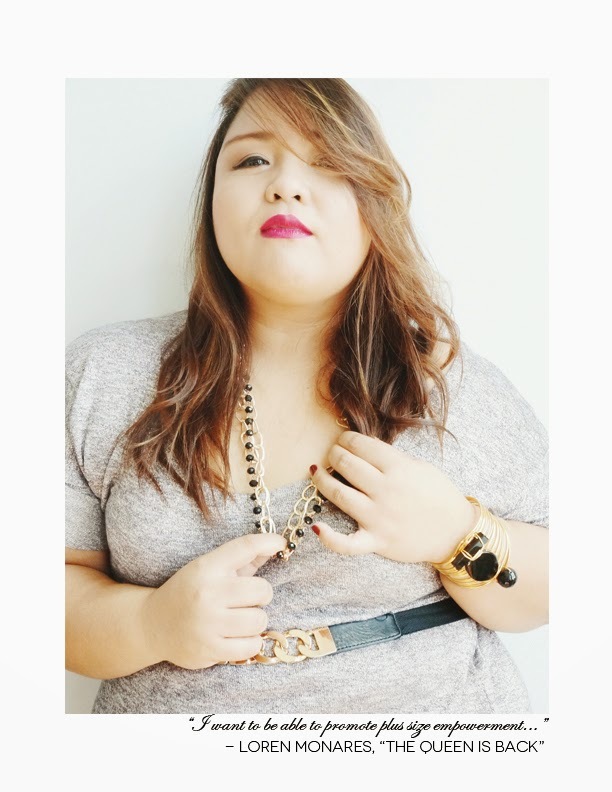 Kat, as you can see, has made use of her talents and skills to be able to positively influence other plus size women. She is a good example of a person who was able to maximize her skills, talent and beauty to be able to reach out and promote change in our society, in her own ways, to understand and accept equality. #11 Final words for the newbies? If you really want it, then go for it! Enough of the doubts about whether you are good enough or not or your dilemma about what you have and what you don’t have. Learn to accept your imperfections and realize that God made us all beautiful and unique. You are not like the others because that’s precisely the point, you are unique and beautiful in your own way because that is how you were designed. So if you really want to be a model and make a difference, start now. Start doing your research and building your portfolio…start practicing and discovering your strengths and identity…and most of all, reflect and understand what’s your main reason why you want to do this.